Join us on June 21, 9 a.m., at TransLink’s head office (400–287 Nelson’s Court, New Westminster) for our Annual General Meeting (AGM)! You can also watch the livestream on Periscope and Facebook. We’ll share highlights from 2017 in transit—from financial to operational milestones—for customers, regional stakeholders, senior TransLink staff, media and the general public. We welcome questions from everyone our AGM, so come loaded with your questions about TransLink and it’s operating companies and we’ll do our best to answer them. Ask away in the comments if you’re watching the livestream. Any questions that we aren’t able to get to will be answered in a future post here. June’s Open Board Meeting will follow at 10 a.m. after a brief break. When: Thursday, June 21, 2018 at 9 a.m.
TransLink’s quarterly board meetings are open to the public and you’re invited to attend next week. 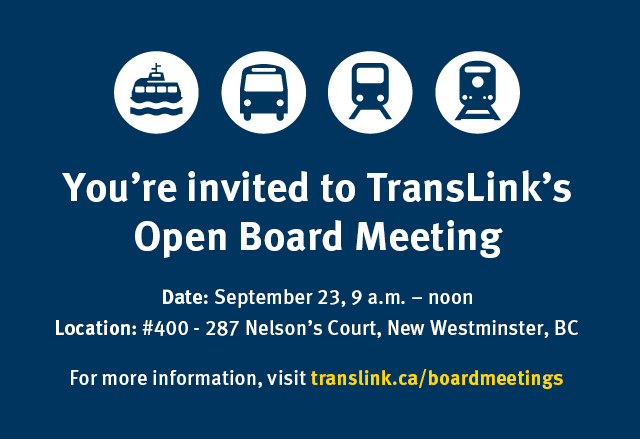 If you have an interest in getting to know the ins and outs of how TransLink works, this is the meeting for you. Get a behind-the-scenes look at TransLink’s mandate, responsibilities, budget and more! All of TransLink’s board meetings are open to the general public. Are you interested in getting to know the ins and outs of how TransLink works? Attend our September meeting and get a behind-the-scenes look at TransLink’s mandate, responsibilities, budget and more! If you followed along with our TransLink On The Move series, you’ll recall we featured five weeks of highlights from our 2016 Annual Report. 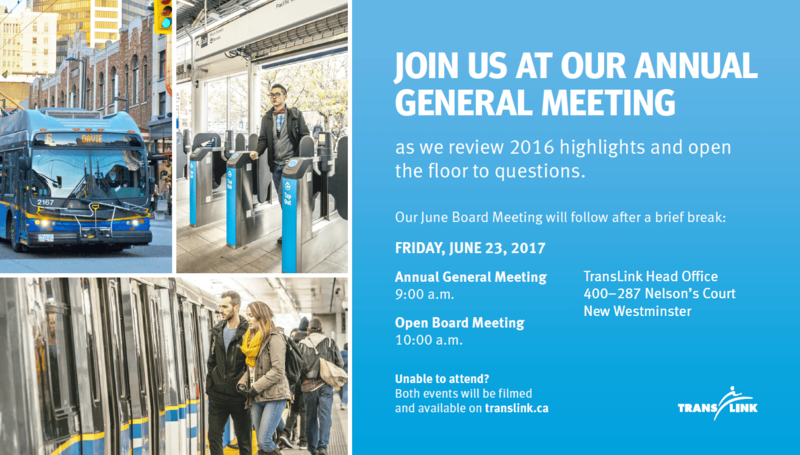 All of TransLink’s board meetings are open to the general public. Interested in knowing the ins and outs of how TransLink works? Plan on attending our March meeting and get a behind-the-scenes look at TransLink’s mandate, responsibilities, budget and more! The meeting for this quarter takes place on Thursday, March 30 from 10 a.m. to 12 p.m. at TransLink Head Office in New Westminster. You can apply to speak at the meeting and find the agenda at translink.ca/boardmeetings. You can always watch our live streams on Periscope and Facebook. UPDATE: In case you missed the meeting, here’s the video of it. 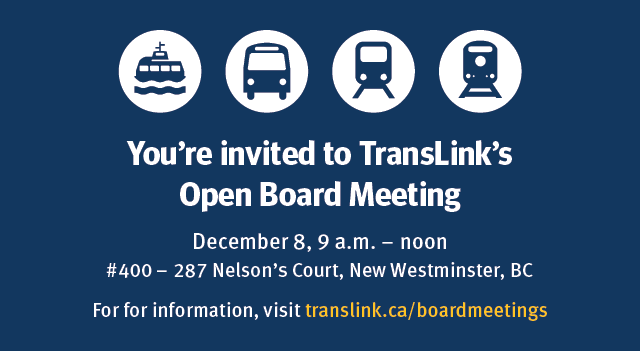 Thursday, December 8 at 9 a.m. to 12 p.m. at TransLink Head Office in New Westminster. You can apply to speak at the meeting and find the agenda on our website. Can’t make the meeting in person? You can always watch our live streams on Periscope and Facebook and follow along with the .pdf of the agenda! 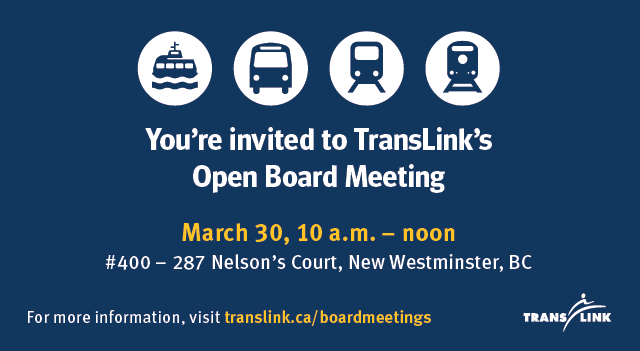 You are invited to TransLink’s next Open Board Meeting! 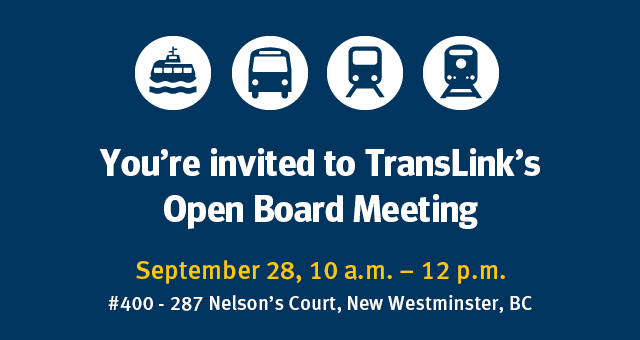 The meeting takes place on Friday, September 23 at 9 a.m. to 12 p.m. at TransLink Head Office in New Westminster. Click here for more information. You can apply to speak at the meeting and find the agenda on our website. UPDATE: Here’s a recording of the board meeting! 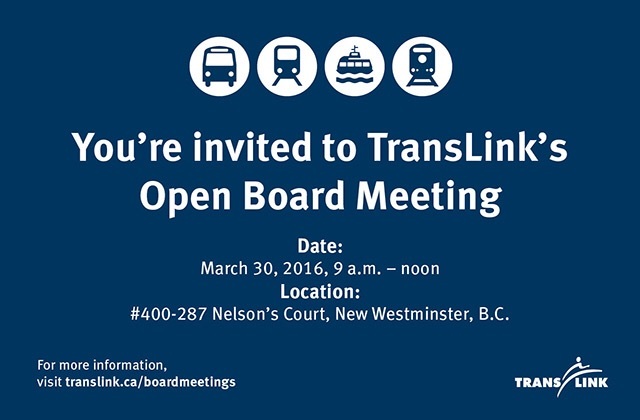 TransLink invites you to our third Open Board Meeting – the first of 2016! The meeting takes place on Wednesday, March 30th at 9 a.m. to 12 p.m. at TransLink Head Office in New Westminster. Click here for more information and to apply to speak at the meeting and find the agenda on our website. You can view the Open Board Meeting in its entirety below. Want to know more about the ins and outs of TransLink beyond the road and rails? Then you should plan on attending our next Open Board Meeting! This is the second open meeting and final 2015 meeting of the Board of Directors. It takes place on Wednesday, December 9th at 9 a.m. to 12 p.m. at TransLink Head Office in New Westminster. If you are interested in attending, please RSVP to: media@translink.ca. Agenda details can be found on our website. There will be a brief press conference immediately following the meeting led by the Board of Directors Chair and acting TransLink CEO Cathy McLay. media event broadcast on Periscope.